My neighbor, who is a nurse, told me her hospital has instructed its staff to don two paper gowns in instances of suspected Ebola. 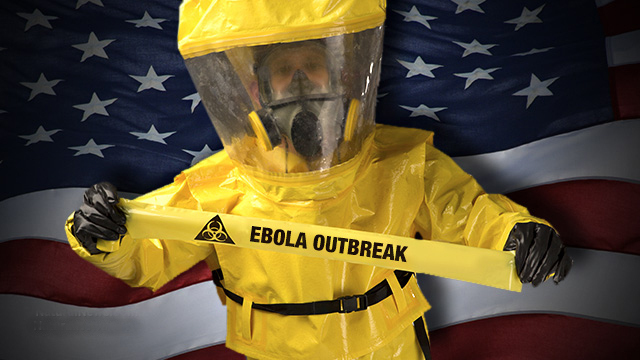 Two paper gowns when health workers in the big cities find that full hazmat suits are insufficient?! Admittedly, the chances are extremely slim of Ebola making its way out here. Plus, this is the healthcare equivalent of local police lusting after all that Pentagon-issued assault equipment to deal with, what… their speed traps? But it does underscore the small-town reality of what it would mean if the handful of infections in the US should blossom into an epidemic that makes its way to the margins of civilization. The place to fight Ebola is in West Africa, not here. Our country should help. But I predict that if Ebola doesn’t get us, something else will. In the early part of the 20th century it was the flu. Sometime later in the 21st century it will be something else. The world is so overpopulated and crowded, we are due for a devastating pandemic. My son Henry tells me that a number of financial websites he visits predict it will hit any day now. The fear of disaster is more dangerous than any real threat. (God, I am sounding like Franklin Roosevelt.) It’s more dangerous to talk on your cell phone while driving (we don’t have cell service out here, either… so we dodged the bullet again). The other day my doctor asked me if I wanted a flu shot, and I told him we are already quarantined at Estrella Vista. That’s good enough. We’re safe. We will be able to see it coming and avoid it… whatever “it” is.